One of my favorite oven dinners is Creamy Chicken, Rice and Broccoli. This particular day I used Bone-in chicken thighs. But you can use Chicken Breast too. And if you want to save yourself a step, just buy boneless. Then I added a second trivet on top of the chicken. and the bowl of rice. If you don’t have a second trivet you can put the bowl directly on top of the chicken. Set the lid, and make sure valve is set to seal. Then select Manual (or pressure cook) button and adjust to 23 minutes. Make sure it is on high pressure. After releasing the remaining pressure, I set the bowl of rice aside. and took out the chicken. reserved the liquid for anything I need chicken broth for this week, and took the chicken off the bones. I dumped in two cans of Cream of Mushroom soup and a splash of milk and dumped everything back in the pot to stir. I really love brown rice cooked like this in IP. It comes out fluffy and soft every time! This is a favorite meal of ours.. normally done in the oven. But I wanted to make a quick IP version. The result was delish!!! 1 bag Frozen Broccoli You can use fresh if you want. Place chicken pieces on top of trivet. prepare pyrex bowl for rice. 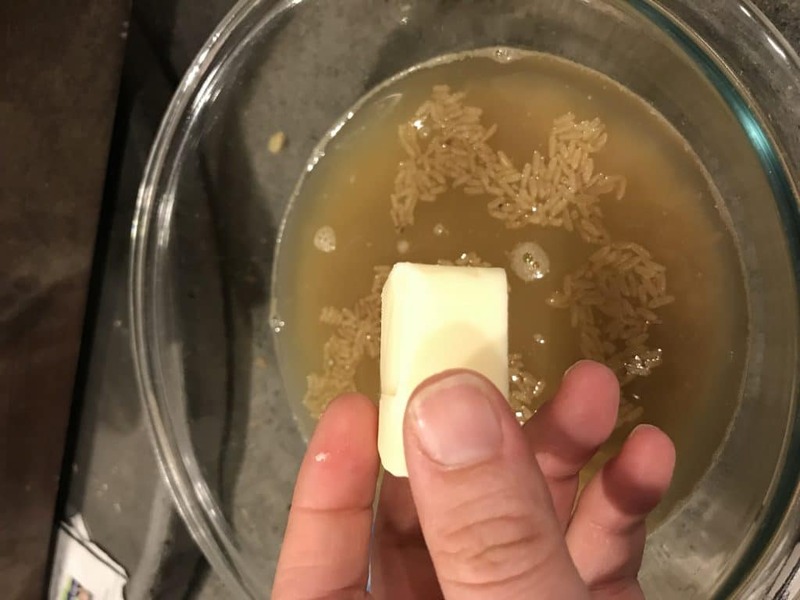 (or whatever oven safe bowl you have that fits) Add 1 cup rice, 1 1/2 cup chicken broth, slab of butter. Place bowl on top of chicken or if you have another trivet. Secure lid and check valve is set to seal. Select Pressure cook ( Manual) high pressure for 23 mimutes. Let Naturally Release Pressure (NPR) for 5-10 minutes. Release remaining pressure. Reserve the chicken broth for another recipe. Mix in Cream of Mushroom soup and milk. 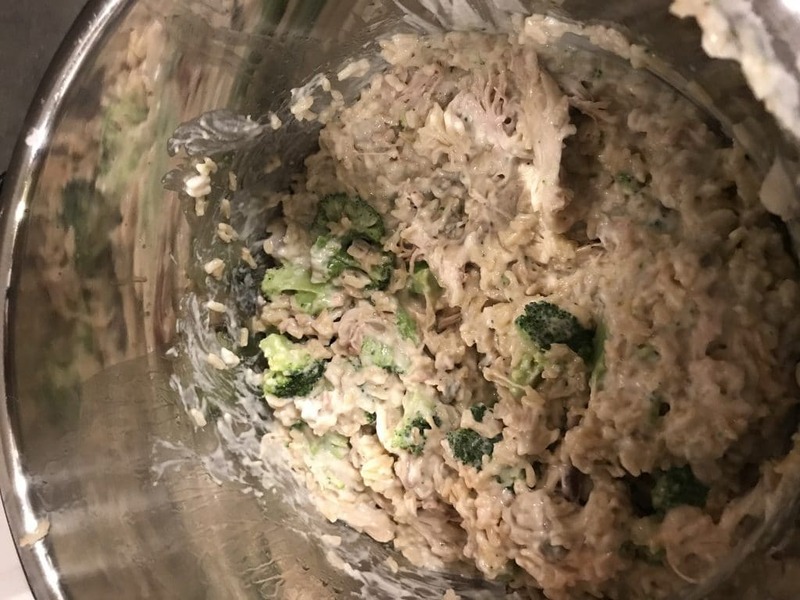 stir in Rice, Chicken and Broccoli. Sprinkle with Pepper and Paprika. Serve! So, I set out to convert it to the IP. 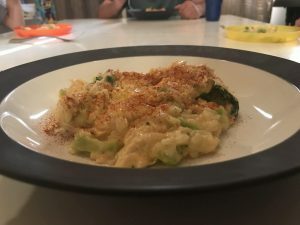 The Result was an amazing dinner done under 30 minutes (and that’s with frozen chicken) continue reading to get our recipe for instant pot creamy chicken and rice. Yes! I can make chicken (from the freezer) in minutes and tada delicious lunch is happening for this momma!! Everyone knows by now how much I love the instant pot. 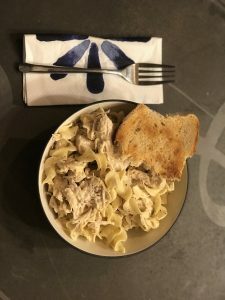 I really enjoy using the instant pot to help me stay on track at lunch time! An easy way to make sure I get my protein in the middle of the day is by cooking chicken. 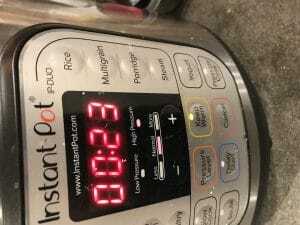 cooking in the Instant pot means you don’t have to thaw it!!!!!! So, usually I just throw one frozen boneless chicken breast or boneless thigh in the pot and season it however I’m feeling that day. Cumin, chili powder, onion powder, and cyan pepper – if I want to make a something like a taco salad or just a little black beans. Garlic, salt, pepper is my go to when I just want to have some veggies or a salad. Celery Salt, olive oil and pepper is yummy too! Cooking this in the instant pot couldn’t be easier! Just grab some chicken out of the freezer and throw it in! I like to use the metal trivet that came with my pot. To me, it seems like the chicken is a better texture when it isn’t sitting in the water/juices. Also with just a little bit of chicken like this, I find it doesn’t need that much liquid to pressure cook. Chicken produces quite a bit of it’s of its own juices (yum chicken broth) and less water makes it come to pressure faster!! So I only put about 1/2 a cup into the bottom of the pot. I set the pot for 15 minutes (high pressure) and make sure it is set to seal. And that’s all I have to do!!!! Usually I set this and then start the boys lunches! By the time I’ve got them sitting and eating, my lunch is done and I get to eat too!!! yay! Last week I had sweet potatoes! 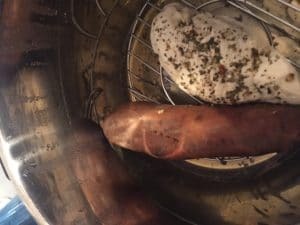 So, I seasoned my chicken as usual and threw the sweet potato in the pot along with it. I set it to the usual 15 minutes and it was seriously perfect!!! Happy Instant Pot-ing to you all! Perfect for a quick easy lunch for 1 or 2! Really you can serve this to the whole family if you want! Place 1/2 cup of water in the bottom of the Instant pot. 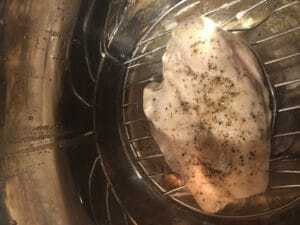 Place Trivet in the instant pot. Add chicken straight from the freezer. Set lid and check the valve is on seal. 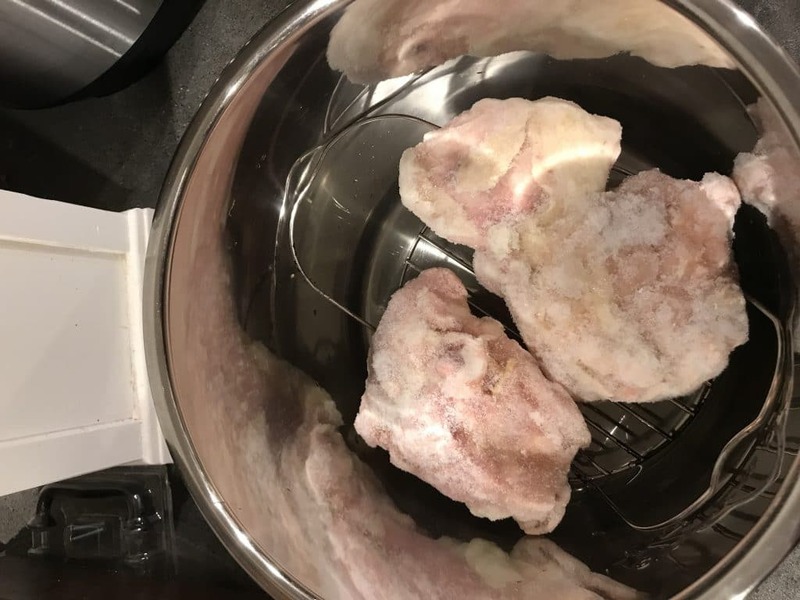 Set Instant pot to 15 minutes (high pressure) If you are doing more than one piece of chicken at a time or maybe a particularly big piece of chicken I would set it to 20 minutes. optional: You can toss a sweet potato in at the same time! Just pierce it a couple times with a fork and throw it on the trivet next to the chicken before starting it!